Shrewsbury, Mass. 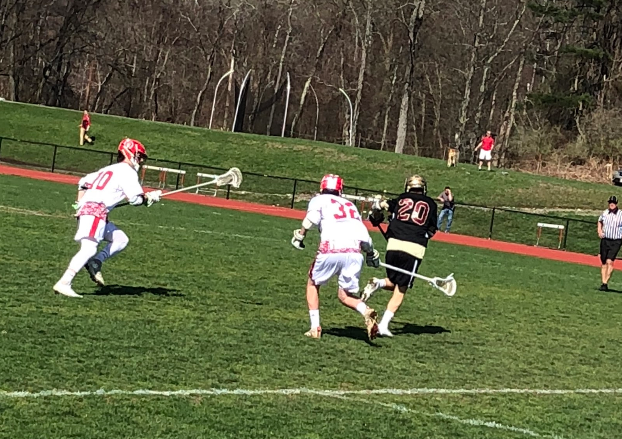 - The Eagles of BC High School defeated the Saint John’s Pioneers 10-6 in lacrosse on Pioneer field Tuesday afternoon. This game resulted in the eighth win of the season for the Eagles, while handing the Pioneers their third loss of the year. Both teams showed fantastic grit and skill throughout the game. In the first, Chi Chi Price (3G) broke the ice for the Eagles, netting two contested and close shots on the goal. UNC commit and BC High School senior defenseman Will Bowen starred on the other end, strongly contesting SJ attacker Jack Donahue, not allowing the senior captain to get into rhythm offensively. Through the first three minutes of the 2nd quarter, BC High attackers gathered two more goals to extend their early lead to 5-0. SJ senior Jack Donahue scored the first pioneer goal and their only goal of the first half. With a goal in the final minute of the half, the Eagles led the Pioneers 6-1 at intermission. The Third quarter is where the tempo of the game changed. The Pioneer sideline was getting louder for support, and they looked for any momentum for a comeback. Each team scored two goals in the quarter, making the score 8-3 heading into the fourth. The Pioneers made a late push by scoring two goals, making the BC High score 8-5 with six full minutes to play. Will Bowen and the Eagle defense was able to guard its net, and BC High shot two lucky deflected shots that trickled into the net ten seconds apart from one another. This crushed the Pioneers and made a comeback impossible. After the game, BC High head coach Steve Lydon reflected on his team's effort. “Once we got comfortable with the lead, we began to play sloppy and not our best," Will Bowen added. "We narrowed down points to defend and fire off shots to gain a more controlling lead. In terms of the Eagles for the remaining portion of the season, expect big things from this group, they’re motivated and really eager to win all their games."